I am promising to the blogosphere that I’ll be up and at’em for a morning workout tomorrow. I’ve become a professional sleeper lately and the morning workouts have been a struggle. My alarm was set to get up this morning for a workout, but Piper’s 1am request for a diaper change and a hug had me setting my alarm back an hour and foregoing my morning sweat sesh. I’m all the more frustrated with myself because 1) my first meeting was at 9am today and 2) I knew I had a 5pm appointment that would not allow for a workout before dinner. I’ve learned that I’m highly unlikely to workout after dinner with the exception of organized sports. C’MON, SELF. I’ve also started seeing an athletic trainer for my jerk of an Achilles. My sessions start with massage (YES!) and end with repeated exercises to strengthen and stretch the entire area between my mid-calf and my heel. Real technical, I know. It’s too bad massage alone can’t take care of the issue…I like that part J The rest of it is repetitive and somewhat exhausting…but I know it’s worth the time, effort, and cost to get healed. The key for me is keeping active with enough rest between runs. I’m also going to ask Santa for arches in my feet because my trainer thinks all of this is due to my PANCAKE FLAT feet. Lovely. As this year’s chili contest marches on, I continue to be wow-ed by the variety and versatility of chili. 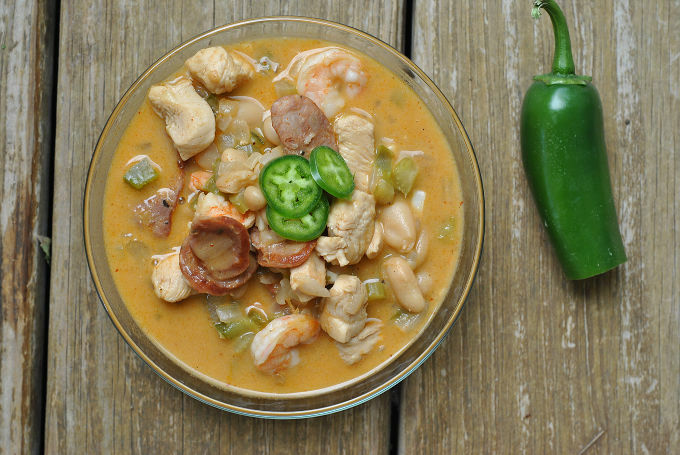 Cajun White Chicken Chili with andouille sausage, shrimp, AND chicken? Heck-to-the-yes. Beans and vegetables, too. 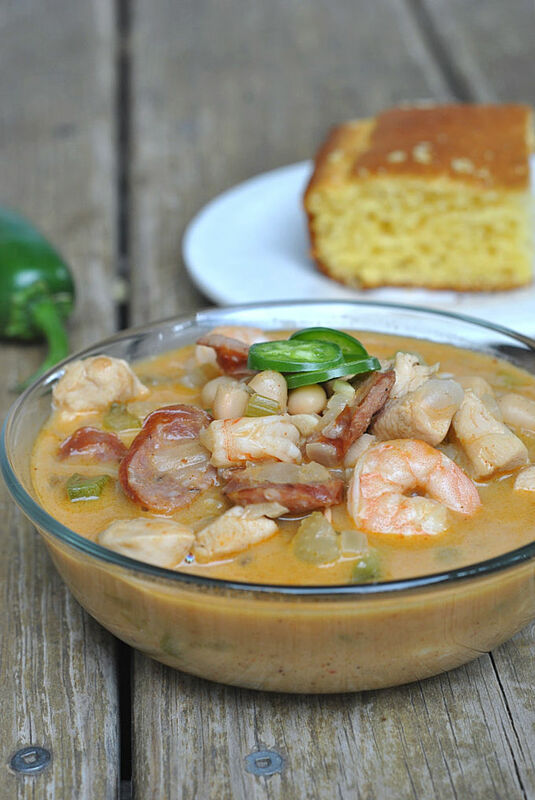 As recommended by Kathryn who submitted the recipe, we enjoyed this chili with cornbread. 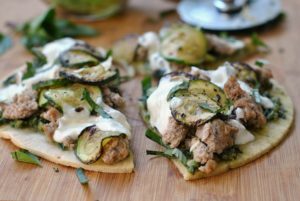 It was absolutely delish and very unique! Pour olive oil into a large pot over medium high heat. Add sausage and cook until browned. Remove to plate with spotted spoon, reserving oil and drippings in pot. Add chicken to pot, cook until browned on all sides. Add in onion, celery, bell pepper, and jalapeno and saute 5 minutes until soft. Stir in garlic, cumin, paprika, chili powder, cayenne pepper, and flour. Cook 1 minute. 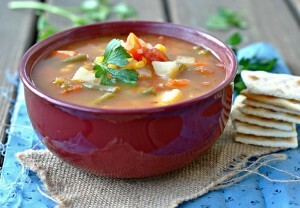 Pour in chicken broth and white beans and bring to a simmer. Simmer 10 minutes. 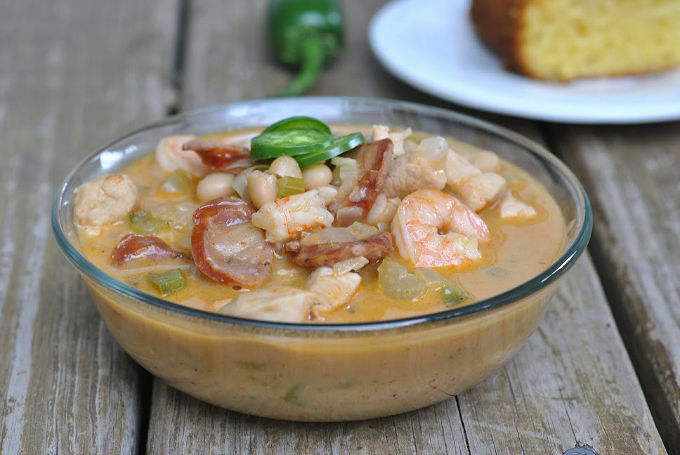 Stir in shrimp and heavy cream and cook 2-3 minutes, until shrimp are cooked through. 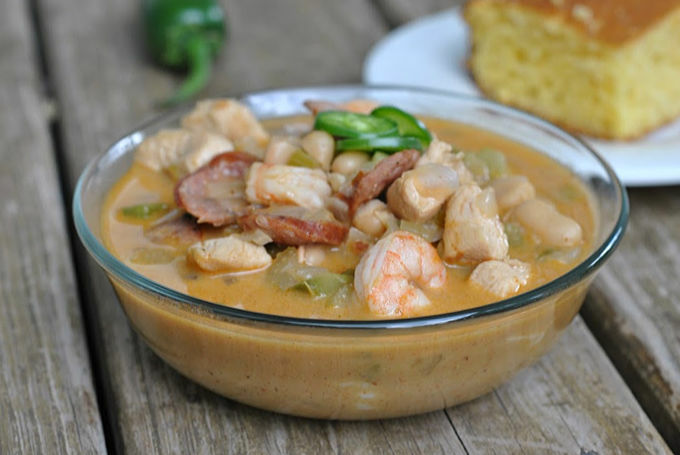 Recipe from The Stay At Home Chef, submitted by Kathryn M.
Lovely, you Cajun white chicken chili recipe looks like even I (With a little help as I am disabled) will be able to pull off. And thank you for laying out not only the ingredients but also the instructions too. That will make it so much simpler to prepare undoubtedly. As I notice on my way around the web, a lot of these healthy eating sites only have the menu/ingredients. They neglect to write any instructions down. This leaves you in the dark lol. PS – How’s Piper these days:)?